Candidates who have the passion to do something for his nation and are eagerly waiting for the opportunity to join Indian Army, for them we are providing the complete procedure of “How to Join Indian Army” and the eligibility criteria required for different posts. People usually think that it is essential to complete graduation/engineering diploma to get entry in Indian Military Army but the truth is, an aspirant can join the Defence Academy even after 10th and 12th standards. In searching of the hardworking and skilled contenders for the posts of soldiers, officers, judges, engineers, lawyers and others in Indian army, the organization releases recruitment notification time to time. There are two types of services provided in Indian National Army which are Permanent Commission (PC) and Short Service Commission (SSC). In SSC, the service is done for a short period of 10 years. After the time period, candidate will be given 2 options whether he will join PC or he can retire. We the team of www.privatejobshub.in is presenting you the Designations which are offered by Indian Defence Force and the process of “How to Join Indian Army”? How to Join Indian Army after Class 10? Candidates who had completed their high school and want to join Indian Army can apply for NDA entrance examination. Aspirants have to clear the entrance test and then they become eligible to attend the SSB interview. Those who crack the interview will get admission in NDA. After completing the course, he will be placed as an Officer in Indian Army. There is one another way to get entry in Indian Army; aspirants are required to attend the recruitment camps which are being held at district level. They will be selected through medical test and physical fitness test. Contenders are required to match the eligibility Criteria which is needed for the Soldier General Duty. 1) He passed 10th standard with 45% marks. 2) He must be in between 17.5 to 21 years of age. Those who match the requirements will go through Medical Test/Fitness Test and Written examination. How to Join Indian Army after Class 12? Aspirants who have done 12th standard are capable to apply through National Defence Academy for Officers and Soldiers posts. Contenders can join the defense academy through NDA entrance exam or recruitment camps. He has to crack the written entrance exam then he will qualify for the next process i.e. Services Selection Board interview. Those candidates who are able to clear the interview round will get opportunity to join National Defense Academy course. After the course is being done, he get place in Indian Army. Individuals can also appear in the recruitment camp and take physical fitness test. After that the authority will take medical test of the short-listed candidates. Then on the basis of these tests, aspirants will be finally selected. The eligibility criteria needed for these jobs are simply different. Candidate should be above than 16.5 years and less than 19 years in age. To get placed as Army Officer, aspirants will go through 3 years of training at NDA and 1 year at IMA. Individual should be in between 17.5 years to 23 years of age. Performance in written exams, fitness tests and medical examination. He has to clear the NDA entrance test which is conducting twice in a year i.e. NDA I and NDA II. After NDA written exam, SSB interview and medical assessment will take place. Those who clear this process will be finally selected in National Defence Academy. 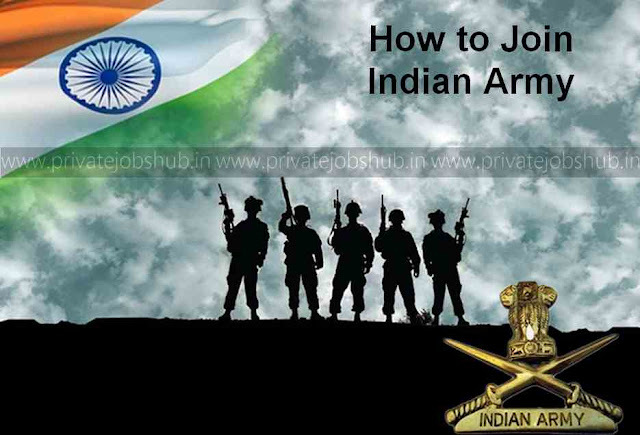 How to Join Indian Army after Graduation? Interested individual must be in between 19 to 24 years of age. Contenders need to clear the Combined Defense Service (CDS) exam. Those aspirant who want to apply against special entries, must have done Law graduation with at least 50% marks and with this 2 year service in NCC Senior Division Army. In this category, contenders will be called for SSB interview. The age requirement for this category is 19 to 25 years. Candidates must be come under the age group of 21 to 27 years. To apply for Judge Advocate entry, one must have completed Law graduation with at least 55% marks. He will get selected through SSB interview and will go through training at OTA, Chennai. How to Join Indian Army after Engineering Graduation? Candidates can join Indian Army after engineering degree through Technical Graduate Course. The authority will short-list the aspirants on the basis of their marks. The short-listed contenders will go through interview process. After that those who selected in the interview round will join the academy for training. 1) Candidates who are doing B.Tech/B.E. are also able to apply for TGC entries. He must be in between 20 to 27 years of age. 2) Those engineering degree holder who comes under the age group of 19 to 25 years can apply. 3) Aspirants must have passed his intermediate school with 70% marks in PCM (Physics, Chemistry and Maths). Candidates, who have decided to build up their career in Indian Army, they may not to wait any more as after 10th and 12th standards we can easily opt this army line. But as the first question strike in every body’s mind is that How to Join Indian Army? So, hereby we are given all the details like Process to Join India Army, Eligibly, Age and all the stuff on this single platform. So all those who are curious to get the Job in Indian Army, they may avail the complete details.